There are some really great options for gluten-free desserts that don't compromise flavor at all! 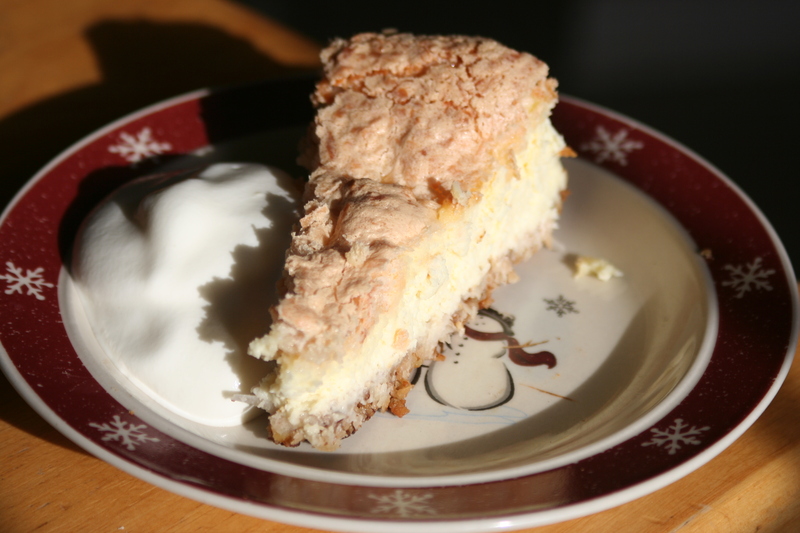 I made this macaroon cheesecake and it got rave reviews from everyone. It's creamy and delicious - the flavor profile is wonderful! In a small bowl, combine the coconut and pecans; stir in butter. Press onto the bottom of a greased 9-in. springform pan; set aside. In a large bowl, beat cream cheese and sugar until smooth. Add eggs; beat on low speed just until combined. Beat in extracts just until blended. Pour over crust. Place pan on a baking sheet. Bake at 350° for 35 minutes. In a small bowl, beat egg white and vanilla until soft peaks form. Gradually beat in sugar, 1 tablespoon at a time, on high until stiff peaks form. Fold in coconut. Carefully spread over top of cheesecake. Bake 20-25 minutes longer or until center is almost set. Cool on a wire rack for 10 minutes. Carefully run a knife around edge of pan to loosen; cool 1 hour longer. Refrigerate overnight. Remove sides of pan. Refrigerate leftovers. Makes 12 servings. 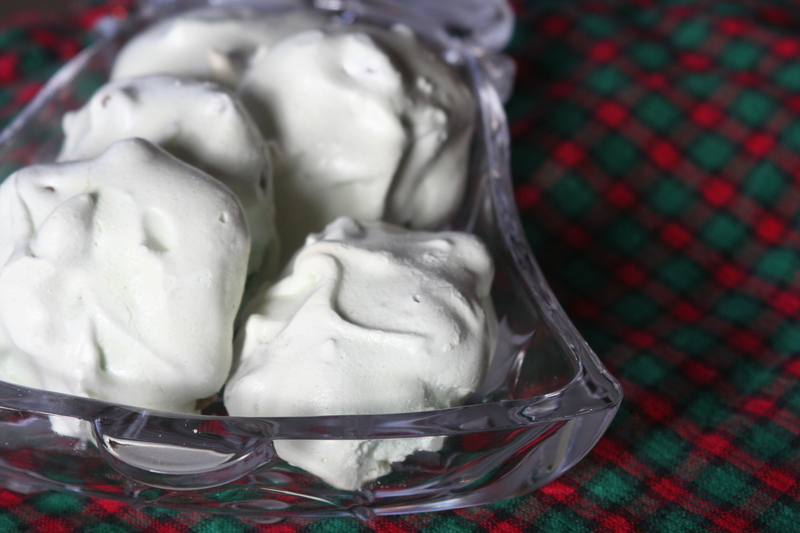 We called theses peppermint chocolate meringues "Martian Eggs" when we were kids and they were an annual tradition - especially at our family gathering. The green-tinted egg like cookies are crispy on the outside and a little softer on the inside with delicious chocolate chips. Preheat oven to 375 degrees. Beat egg whites and salt until frothy. Slowly add sugar and beat until stiff. Add food coloring if desired. Fold in mint chocolate chips. Drop on ungreased cookie sheet. Turn off oven and put cookie sheet in oven and leave in oven for 2-6 hours or until crisp on outside and chewy on inside. (Mine took 2 hours 15 minutes but it depends on the humidity.) Makes about 3 dozen. Preheat oven to 350 degrees. Line 1 or 2 cookie sheets with parchment paper. Combine almond meal, sugar, egg white, and extract in lg. bowl. Beat with mixer until thoroughly combined and dough is a thick, sticky paste. Drop the dough by level tablespoonfuls, arranging about 2 inches apart on the prepared sheets. Using a pastry brush lightly moistened with water, brush the tops and sides of the macaroons, gently pressing down on them to form smooth rounds about 1/2 in. thick and 1 3/4 in. in diameter. Bake 15-18 minutes or until the macaroons are lightly golden. They should feel crisp on the outside but soft inside. (Rotate cookie sheets halfway through if using two). Cool for 5 minute, then use a thin metal spatula to remove the macaroons from the paper. Place on rack to cool completely. CHOCOLATE: Melt chocolate and dip, drizzle or ice the cooled macaroons. Store layered between wax paper for up to 5 days. 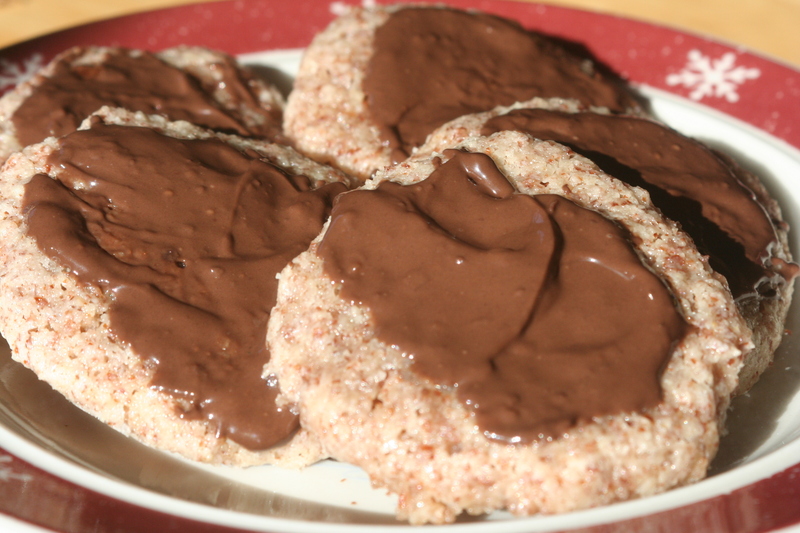 Without chocolate, the macaroons can be frozen up to two months. Makes about 32 cookies. wow, these all look sooo good!